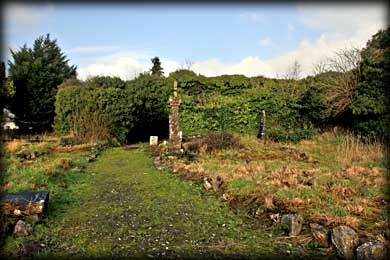 A small walk from Ballymote Castle will take you to the ivy-covered ruins of a small Franciscan Friary. It was founded c.1442 AD by three brothers, Patrick, Andrew and Philip O'Coleman, under the patronage of McDonagh, who was then in residence at Ballymote Castle. A head with a papal tiara over the western entrance is thought to be that of Pope Eugenius IV who granted permission for the founding. Sadly this head is now completely obscured by the ivy. The abbey was destroyed by the O'Rorkes about 1584 to deprive the then English occupant of the castle of any advantage it might be to him. Many of the stones from the abbey are believed to have been used to build a "Mass House" in the early 1700's or to mark the graves of the poor and famine victims. 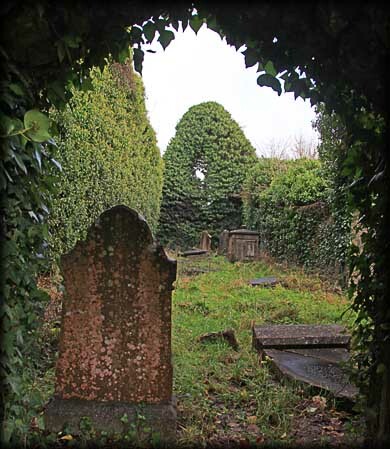 At this time the abbey and surrounding graveyard have become a bit of an eyesore, it has sadly been badly neglected, with scattered stones and broken headstones in overgrown surroundings. Hopefully the OPW or the local people will clean up the site soon, but in its present state we would not recommend a visit to this site. Situated:Very easy. Located in the centre of town, at the junction of Sligo Road and Station Road. Discovery Map 25: G 6604 1576. Last visit Dec 2011.